It appears that our lovely weather has come and gone in Wales! We had a whole week of sun – record-breaking! We’re back to the usual dreary, clouds and rain unfortunately for the Jubilee weekend! I decided to reminisce the lovely weather by painting my nails in a summery theme! I did start of thinking I’d do some jubilee nails but there are already so many out there haha. I did do a Brit Theme nail art a while back for the Brit Awards if you guys want to check that out! I’ve been rather lazy with my nails lately, as I’m trying to grow out the damage I’ve caused them through all the painting, stripping, file and buff! But here’s my latest nail design, there’s not really much to it, just a quick and simple, ring finger manicure using girly Pinks and Creams then topped off with a pretty sparkle. 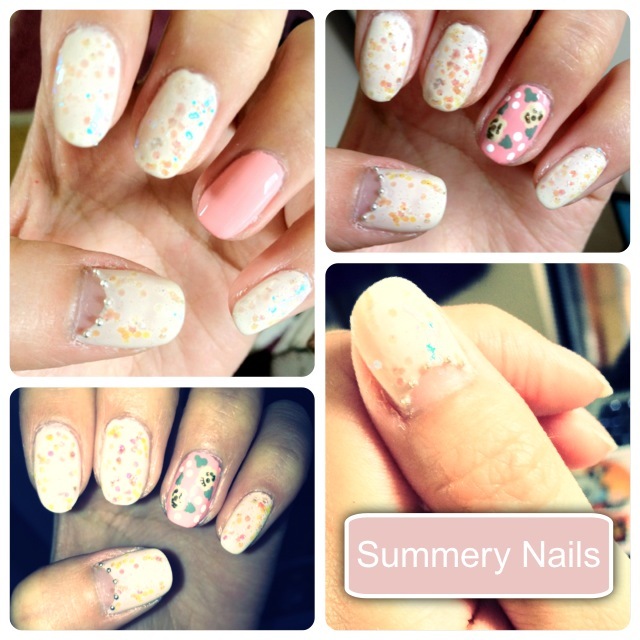 Tags: Beauty, Nail Art, Nail Care, Nail Polish, Nails, Ring Finger Manicure, Summer 2012. Bookmark the permalink. Previous post ← Happy Birthday! Welcome to KAKA’s Bakery! HA!